Techno is a global phenomenon. It may be more firmly rooted in some places – Berlin, Detroit – than in others, but one of the joys of techno as a form of music and as a movement is the way in which techno clubs and labels can be found in almost every major city in the developed world (and elsewhere), and the kind of connections that spring up between producers and labels, DJs and clubs separated geographically, but united in a common passion for the music and by the work of technological wizardry that is the internet. 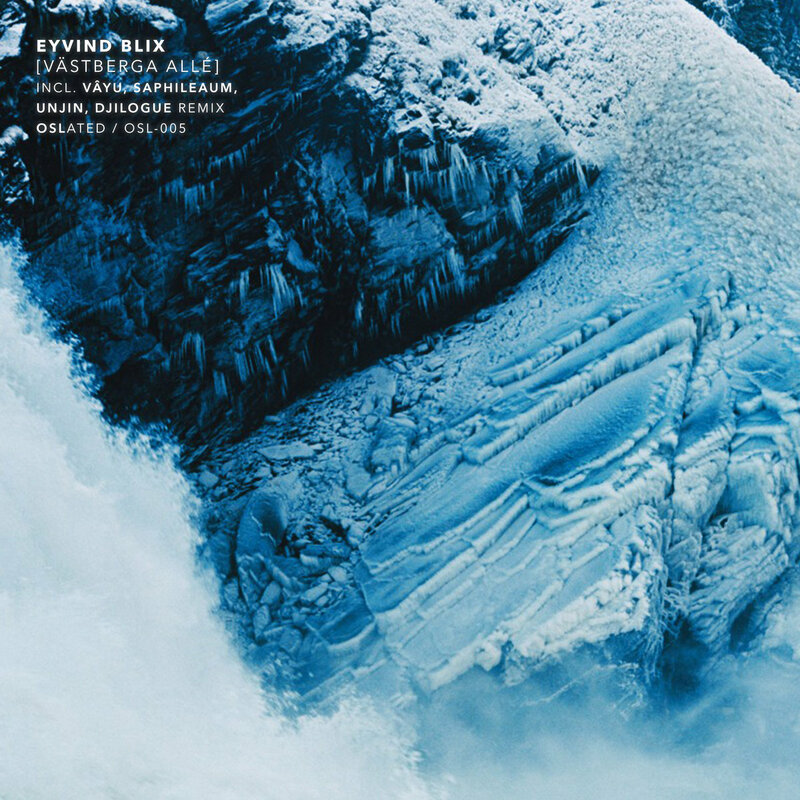 This album, Västberga Allé by Eyvind Blix, exemplifies this interconnected aspect of the techno world. Eyvind Blix hails from Sweden, with the title Västberga Allé having been taken from the name of a street in Västberga, an industrial area in Stockholm notorious for being the site of illegal raves in the city. The label it’s been released on, however, is based in Seoul; Oslated, run by Jong-min Lee (aka Oslon) emerged out of the Oslated podcast series and is closely associated with the Constant Value warehouse parties and with the city’s premiere venue for techno of a dark and insular variety, vurt. It’s an interesting example of the international character of this kind of music, emblematic, to me at least, of techno’s ability to transcend boundaries. The first track, ‘Elektra’, features a murky bass-kick combo submerged deep in the mix under a swell of constantly-evolving abrasive pads and insectile percussion. It’s a meditative, hypnotic piece, setting the tone for the album to come. It’s followed by “Maskinrum”, a more insistent number consisting of a jackhammer beat, subliminal synthesizer wails and hyper-repetitive looping percussion, coming across like a field recording from a Soviet uranium mine. The third track, “Introvert”, follows a similar kind of formula, presenting listeners with a barrage of rapid but muffled bass kicks, tribal plastic-bottle percussion, chattering robotic voices and two noisy crescendos of machine noise in place of traditional breakdowns which taken together form one of the high points of the entire album for me. By fourth track, “Karusellplan”, the album starts setting its eyes more firmly on the dancefloor; staggered, slightly off-kilter beats, intricate bursts of sonic detail and a muscular, droning lead that dominates the track’s latter half gives “Karusellplan” a groovy kind of feel that definitely got my head nodding. The fifth track, “Hemlängtan”, is an interesting example of how good techno music can be at displaying contrast; the kick and rumbling bass are crushingly heavy, but the sounds swirling around them – dub-like reverberation and a high-pitched, resonant three-note pattern that shines out of the darkness every so often like the beams of a lighthouse sweeping across a dark ocean – felt light and almost wistful, inducing in me a great sense of tranquility. This moment of respite is followed by the album’s biggest banger, “Drivhjulsvägen” (try saying that five times fast), a driving dancefloor bomb that derives a lot of mileage from a repetitive distorted synth pattern and a bone-shattering kick drum. The album is rounded out by four stellar remixes from other Oslated associates. Vâyu’s remix of “Karusellplan” transforms the track into a rich ambient techno soundscape; while it maintains a sense of forward motion through the ebbs and flows of the bassline it feels very much more tailored for home listening (or opening/closing sets, perhaps) than for dark basements at 4 a.m. Saphileaum’s “1st Sky” mix of the same track takes a similar kind of approach. It’s slightly more beat-focused, but maintains a similar sort of spacey, floaty atmosphere, livening things up with an epic trance-like breakdown and synth chords towards the end. The remix of “Hemlängtan” by stalwart vurt resident Unjin, on the other hand, combines a rigid kickdrum groove with glowing pads, woodblock percussion and starship-engine-room ambient noise to create a track at once both cerebral and intensely physical, the kind of beat I’d be equally happy to dance my feet off in the club to as to listen to on the subway home. The closing track, a remix of “Drivhjulsvägen” by another vurt resident, Djilogue, is one of the most interesting tracks on the album, taking Eyvind Blix’s banger apart and reassembling it as a slinky, sleazy slice of brothel techno, bringing to mind the image of cyborg assassins stalking the streets of some far-future cyberpunk vice district. All told, Vastbergä Allé is a worthy addition to the Oslated catalogue. It’s a well-crafted collection of deep, mesmerising techno that has something to offer both for DJs looking for material for their sets and for home listeners looking to space out with their headphones on. It’s not especially original or boundary-defying as an album, but not all music has to be innovative to be good; Eyvind Blix doesn’t do anything particularly new here, but he does display a refined understanding of and mastery over all of the tropes and tricks of techno, and utilizes them to extremely good effect. Vastbergä Allé is available for purchase as a digital album over at Oslated’s Bandcamp.